It's Sunday, and that means that it's time for the Sermonette. To make it easier for you heathens to take the morals of the story from this polemic, they are highlighted in red. 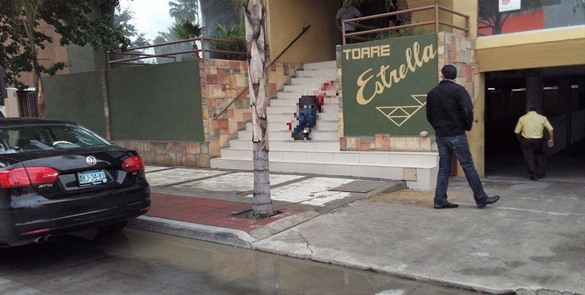 Life on the mean streets of Tijuana isn't worth much. I was speaking with a mexican lawyer this past week while I was down there. He told me that one of his clients was gunned down on the steps to his office as the client arrived to pay the agreed fee. He maintains that there was no connection between the arrival to pay what was owed and the assassination. A picture from the newspaper is referenced (above right) for you. You'll notice that passers-by take it all in stride - another carcass riddled with bullet holes bleeds out on the stairs of an office building in Zono Rio (River District) - a relatively nice area populated by professional offices. I asked if he was able to recover the fee from the corpse before the police arrived. "Of course," he said, "I wouldn't be much of a lawyer if I couldn't do that." Truer words were never spoken. I asked him to send me the photo for the blog. And now I'm sharing it with y'all. Yes, I still do work in Latin America. And no, it's not safe. But it's not as dangerous as it would be for me to work for the Clinton Campaign. "Ask not for whom the bell tolls. The photo (left) is from a dust up that I had in Los Mochis, Sinaloa in February of this year. 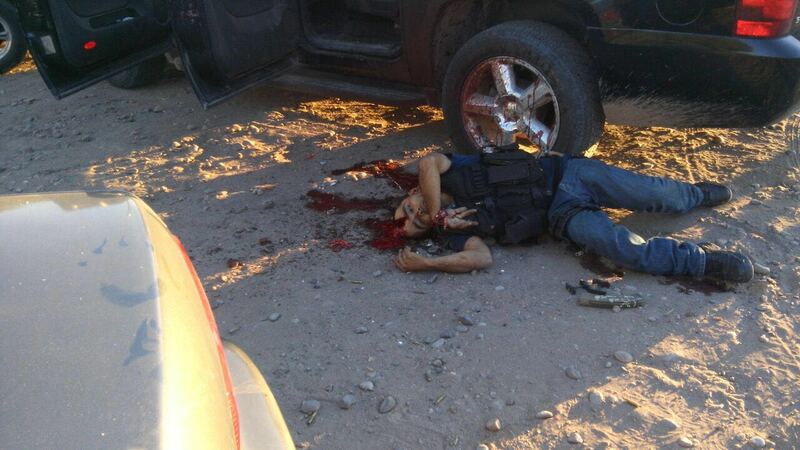 The narco was ended with a double-tap to the chest and then head shot before he could get a round off. It's always best to shoot first and ask questions later when you're in the badlands. Speed is fine but accuracy is final. They say that you never hear the bullet that takes you out. The Golden BB. Despite all of that, Tijuana is a safer area than Chicago (home of Barack and Michelle) is. Chicago's body count is higher than Juarez and Tijuana combined. But Chicago is far more progressive because it's run by the Democratic Party Machine - which has a lot in common with a drug cartel. And oh, by the way, guns are illegal in Mexico. This is Mr. Trump's Solution to the Swamp (link). I'm serious. This will fix the problem. "...Nearly all intelligence officials who are fired, retired, pushed out, or resign from the intelligence agencies keep their security clearances. I do not know the specifics of any individual’s clearances but it is nearly certain that opponents of the current administration such as John Brennan, an aggressive Trump critic; James Clapper, who warns that Trump causes an “internal assault on our institutions”; Michael Morell, author of “I Ran the CIA. Now I’m Endorsing Hillary Clinton”; and recently fired leaker James Comey retain top-level security clearances. "Security clearances are a deep state guild or union card allowing the holders to swan about intelligence facilities, chatting, gossiping, and gathering intelligence that they can leak to journalists." Pull security clearances on the deep state has-beens who don't need them and tell them to go out and prune the roses.